Coffee at The Cabana – Tune In Every Monday! 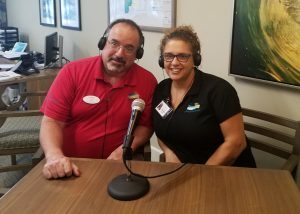 WPSL and The Cabana at Jensen Dunes are thrilled to be partnering on a weekly segment called “Coffee at The Cabana.” Join WPSL and The Cabana’s own Joe DeCarlo and Jennifer Lussier-Fontaine as they discuss senior care topics, upcoming events and take questions from callers. Tune in every Monday from 10 a.m. to 11 a.m.